A little background may be necessary here for those who do not follow baseball (like me). 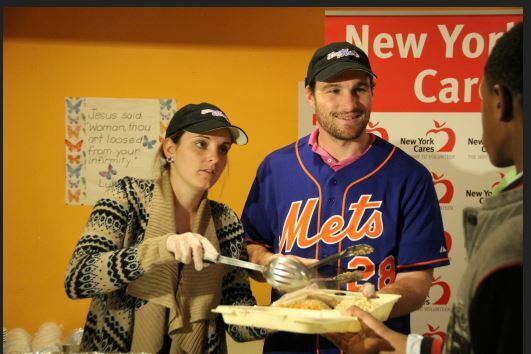 Recently, Daniel Murphy of the New York Mets received a LOT of criticism for taking paternity leave that caused him to miss opening day. In essence, he getting blasted for choosing to be with his wife for the birth of their child rather than play in the opening day game (1 of 162 games each season). Former NFL quarterback stuck his foot so far down his throat that he had to issue a very contrite apology. Yesterday's post looked at the ways paternity leave is changing for men. So here is some response from David Zirin at The Nation on this issue. Many have verbally stomped them for the nature of their comments—well done, Chris Hayes—and Esiason also issued a fulsome apology. I would also add that the only reason Daniel Murphy even had the option to take this time off is because it was collectively bargained into his contract by his union. There are millions of men in nonunion jobs who don’t even have this option, not to mention millions of women who risk their employment in the United States by taking time off after the birth of their child. I think there is something else going on as well. The comments from Boomer and Francesa smack of a kind of existential fear from an older generation of sports radio jockeys about the ways in which definitions of masculinity and sports have been rapidly changing. There have been two dominant kinds of masculine archetypes for the last thirty years in sports. Either you could be heterosexual, misogynist, talking loudly but saying nothing with a goal of trying to become a commercial brand; or you could be a heterosexual evangelical Christian, talking humbly with a goal of trying to become a commercial brand. Those who strayed outside of these norms have only done so with considerable risk to their standing in the media or even their job. But in the last two years, these archetypes have changed. We have seen players such as Jason Collins, Robbie Rogers and Michael Sam break new ground as gay athletes. We have seen Royce White and Brandon Marshall speak out about their mental health challenges and show that this kind of openness does not demonstrate weakness but courage. We have a new cultural consensus that does not see concussions as a bizarre badge of honor but a danger sign. We’ve had Jonathan Martin go public about being bullied by teammates, forcing the NFL to confront long-standing locker-room behaviors. Poisonous, narrow definitions of masculinity are being challenged. A player’s missing opening day to be with his wife on the birth of their child clearly caused Boomer’s and Francesa’s brains to rupture. Their idealized sports world as a masculinist cocoon absent of progress and insulated from the real world, where every day is 1985 (or even 1955), is withering before their eyes. People are deciding that ruining your life and your relationship with family in the name of a code that impresses the Mike Francesas of the world isn’t worth it. This is progress, but as in any time when we see progressive healthy change, the hounds of reaction will still nip at its heels.